This is a great little diy project, especially with Valentine's day coming up! You can customize a mug, plate, or any other ceramic dish of your choice and make it really personal for that special someone. 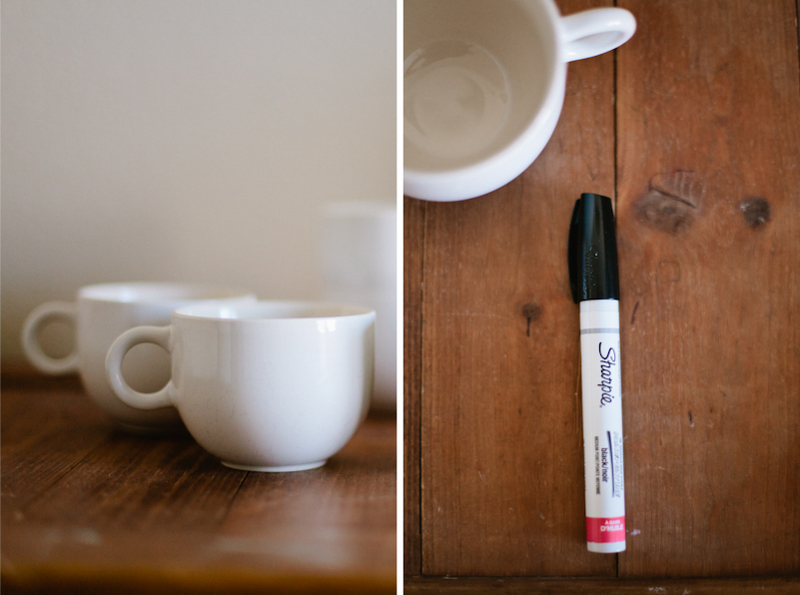 >> Make sure the mugs are clean and no oil or residue is on it before you start painting. If you want to, as an optional step, clean the mug with alcohol to triple check its cleanliness. >>When you are done designing your mugs, let them sit and dry, preferably over night~a full 24 hours. It helps to set the paint for the baking process. >> Place the dried mugs onto a cookie sheet upside down, and set it in the middle rack of the oven. DO NOT preheat the oven! Once the mugs are in, set the temperature to 425 degrees F. Start timing 30 minutes once the oven reaches 425. While in the oven it did seem to give off a weird smell, so if you are sensitive, make sure you let the kitchen air out while the mugs are baking. >> Let the mugs cool in the oven as much as you can before removing them. I just left mine until the oven was completely cool. This is to prevent any cracking from sudden changes in temperature. No way! You are so much more creative than me, anything you decide to make will turn out so cute, Im sure! PS your little penguin is just cute as ever! I miss him...and you so much!! Thanks Kaman! Let me know how your mugs turn out!! I write on mugs all of the time and use this same technique! Thanks for sharing! I will point people your way if they ever need to know how to do this! So glad to hear that you have also tried this method! Thanks for your lovely comment and positive feedback! Have you had any luck using colored oil based sharpies? Christine, I have not personally tried the colored oil-based sharpies but the site I referenced to did use red and the color changed to a deeper red/purple color. I would definitely do a trial spot on the bottom of the cup or somewhere unnoticeable if you are wanting a very specific color. Hope that helps!! I haven't tried with glass, but this method works so well because the glaze of the ceramic dish "melts" in the hot oven and allows the ink of the sharpie to sink into the glaze. I think there would be other methods for drawing/painting on glass, I just haven't tried. Sorry for not being more helpful! Thanks so much for commenting!! Do you need to use oil-based sharpies? For best results using this method, I recommend using oil-based sharpies. I have not used any other kinds of pens. I really love you're idea and i want make this as a Christmas gift to my friends,,but what if i don't have an oven?..what should i do?...can it just a oil sharpen marker pen?..please help me.. Thank you for your comment! I would not recommend just using the oil-based sharpie without baking it, it will come off much easier. The idea of this is to "bake in" the sharpie ink into the glaze of the mug/dish, so if you don't bake it, the ink will not become a part of the glaze, it would just sit on top. I hope that makes sense! Did you ever put them in the dishwasher? Excellent tutorial! How have these held up in the long term? is it acceptable to drink from these mugs? Thanks. Are you looking for high quality canvas prints to decorate your wall space? We have an exclusive collection of readymade canvas prints, You will find our canvas prints vibrant and stunningly beautiful for your homes and offices. 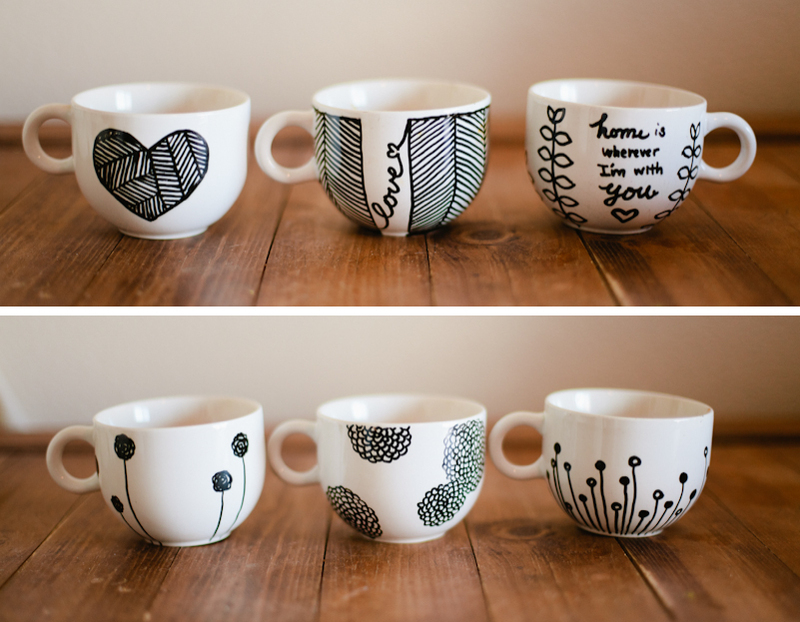 The DIY procedure on personalized mugs is convincing & sure, I will try to make these type of mugs at home. 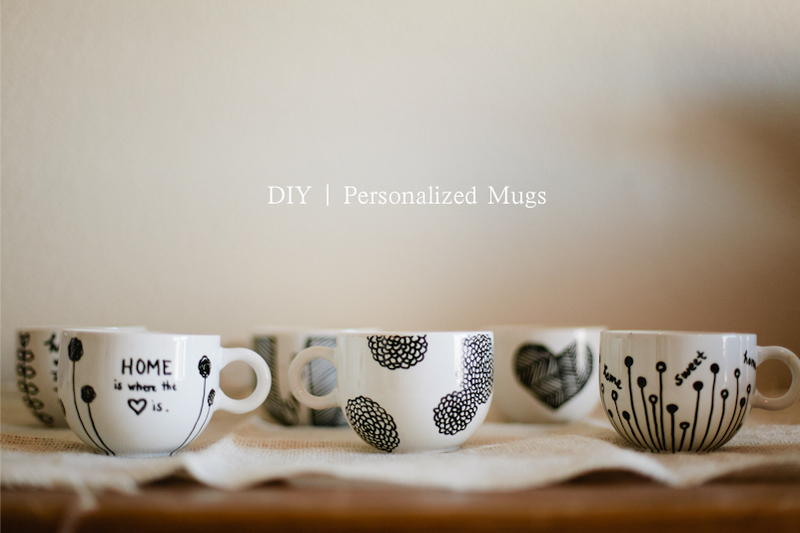 Thank you Megumi for sharing DIY Personalized Mugs Method with us. The sharpie ink still comes off of my mug if I wipe it with alcohol. even hours after they were baked. Is tht normal? I have tried the Sharpie method but found that it washes off after a few uses. You can get the same effect if you use porcelain pens, available at craft stores, then follow the instructions on the pens to bake the ink in. 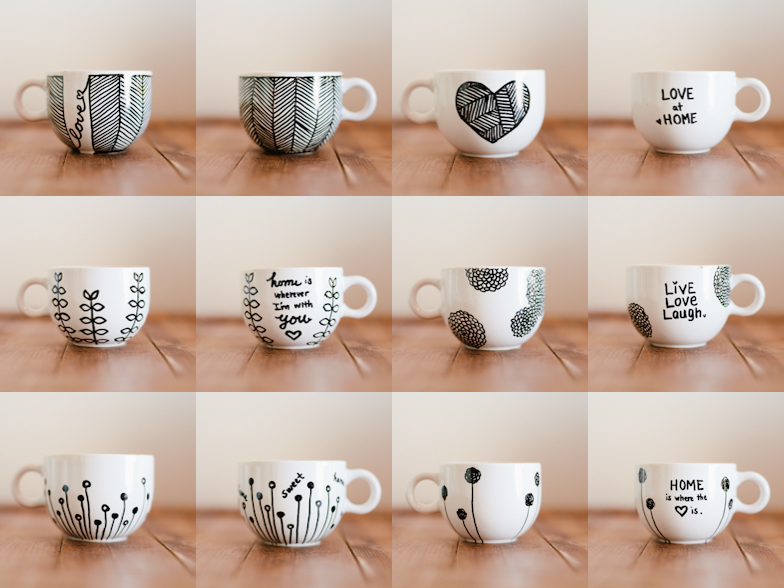 I have been creating these mugs - same everything oil based sharpies at 425 degrees. It was working for a few months and lately when I bake them, the black sharpies seem to chip off - like it is in the oven too long. Then, I put them in at 325 and they seem to wipe off. So I tried again at 350 degrees and same result. nothing had changed when I first started doing it and I cant seem to figure out what is happening and why is it now not curing correctly. Ive been through dozens of mugs in the past month with all the same result. Help? These look amazing. I just found my last minute holiday presents. Thank you for posting these. Excellent Post! Customized Designer Mugs with Photo printed Online in India. Trophykart offers Customised Mugs & creative gifts for every occasions like diwali, new year, birthday, wedding, anniversary at affordable price. Amazing post, And all the Mugs are beautiful. Lovely post Megumi!!! I will use your tricks in order to make my xmas mugs to give them friends and family!!! Thanks for the post, it's brilliant! lovely.! Buy Trophies Corporate Gifts, promotional items, photo Mugs Online. The blog was absolutely fantastic! Lot of great information which can be helpful in some or the other way. We are an innovative web design company in Austin offering the widest range of website development, search engine optimization & internet marketing services. Use any flavor cake mix and complimentary flavor of pudding mix. For the glaze, use a complimentary flavor of powdered mix, such as lemonade for lemon, cocoa for chocolate, etc. Buy attractive coffee mugs which hold 1 1/2 cups water. Thank you so much for such a wonderful blog. I’m really thankful to you for this informative…..